What Is the Average Lifespan of the Common Cat? Cats can live a long time. The average lifespan of a cat is about 15 years, so they often outlive most of our pet dogs. A teenage cat, or even one in their twenties, is not uncommon to see, but many factors can play a role in determining how long your cat might live. Cats have been kept as pets for thousands of years. They originate from the Near East countries where they were domesticated from wild cats to help control rodent populations. These cats spread throughout the world as pets and we eventually started selectively breeding them for specific traits, thus creating different breeds. The primary cat breeds were originally bred using cats from four major regions; the Arabian Sea, the Eastern Mediterranean, South Asia, and Western Europe. These four regions have produced cats that have different genetic markers based on what region, or race, they are from. While it is impossible to know exactly how long a cat will live, some breeds of cats are known to often live longer than others. The Siamese and Manx cat breeds are two that often outlive their cat competition, but other breeds have been recorded as living into their 20’s and even 30’s. Both purebreed and domestic mixed breed cats have the potential to surpass the average lifespan of the species. Watch Now: How Long Do Cats Live? Cats primarily eat meat, so they are considered obligate carnivores and this should be reflected in the food we feed them. A lot of research has been done to determine the dietary needs of a house cat, so the food options that are available to cat owners are plentiful. But not all foods are created equal. Adult cats cannot digest large amounts of carbohydrates or lactose, so these are unnecessary ingredients in their food. Carbohydrates can even decrease how much protein is digested, so they are in fact harmful to a cat. Proteins, on the other hand, are very important to a cat. Cats require a large amount of protein when compared to a dog, due to their unique digestive system. Adult cats should receive at least 5.5 g/kg of protein a day. This means the average eight pound cat needs to consume at least 20 grams of protein each day and often much more. Essential amino acids are also very important to a cat. Taurine, methionine, and cystine are some of these essential amino acids and without them, important vitamins, and the proper amount of protein, a cat’s health may suffer greatly. Of course a cat that doesn’t eat a healthy diet may develop health issues, but parasites and diseases can also affect their health. Some diseases have long term effects on cats and may also shorten their lifespan. Poor genetics, immune-compromised cats, and cats that have compromised organ functions might not live as long as healthy cats. Some cats are considered indoor pets, others are strictly outdoor pets, and others still will be indoor/outdoor pets that split their time between environments. The daily risks that outdoor cats take are much higher than those of an indoor cat, so the lifespan of an outdoor cat is often cut short. Avoiding getting hit by vehicles, hurt by wild animals and eating toxins, finding food, surviving the elements, and being exposed to various parasites and diseases may all be daily challenges for an outdoor or indoor/outdoor cat. The more time a cat spends outside, the greater the risk is of an injury or illness from that environment. Indoor cats are not exposed to as many risks since they are sheltered inside a secure home. Wild animals and vehicles pose no threats to an indoor cat, their diet is typically controlled, and toxin, parasite, and disease exposures are lessened, especially if they are vaccinated and on preventative medications. The same is true for big cats like lions, tigers, ocelots, and other wild cats. These cats that reside in zoos often outlive their wild counterparts. 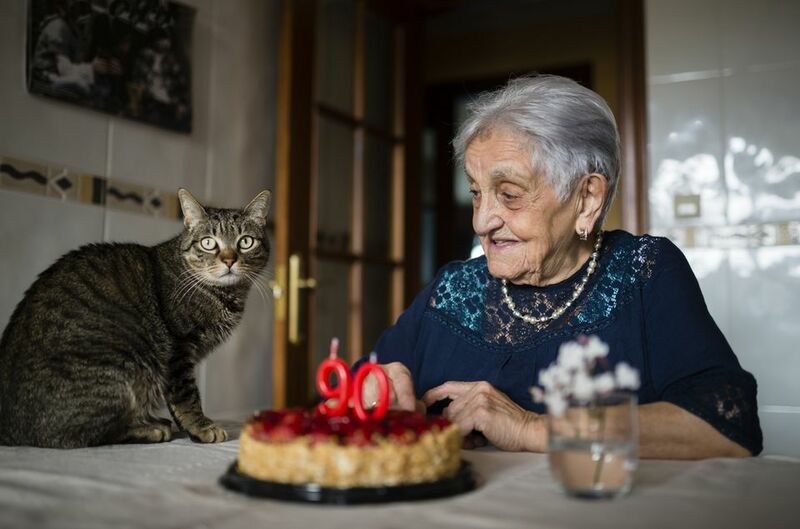 Guinness World Records lists the oldest cat as having lived 38 years and three days. Crème Puff was a domestic shorthair cat that was sometimes fed odd things such as asparagus, eggs, and heavy cream. She was born in 1967 and died in 2005 in Austin, Texas. It is unknown exactly how Crème Puff was able to live to be such an old cat, but a combination of loving care, good genetics, and a safe environment were probably key factors. While we never have complete control over our cat's lives, we can be sure to offer them a safe, healthy, and loving environment to increase the odds of them living a long life.